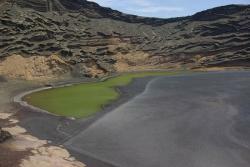 Find out the Charco de los Clicos, Lanzarote (Los Clicos Puddle) in Yaiza, Lanzarote. Charco de los Clicos (Los Clicos Puddle) is located in Yaiza, on the northwest part of the island of Lanzarote. 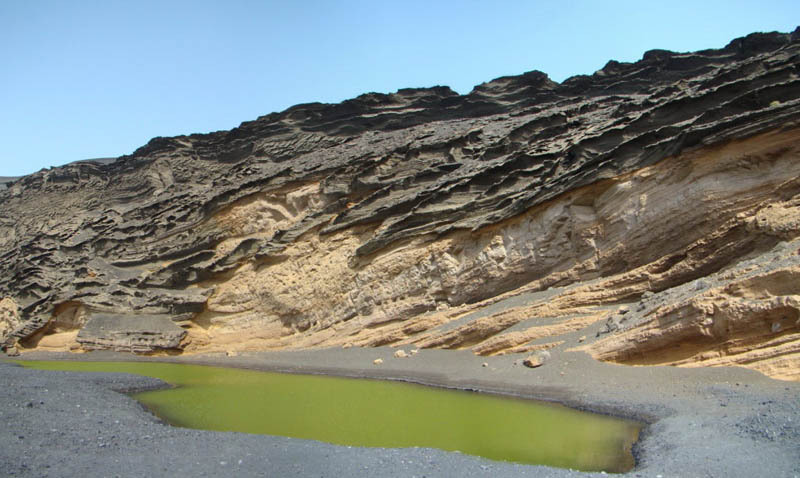 The Charco de los Clicos forms part of the geomorphological unit also known as El Golfo, located in the Natural Park of Los Volcanes. It is a big open crater that reaches the sea which contains an unusual green lake formed by the seawater upwelling on its surface. This unusual lagoon is connected to the see through many underground cracks and it’s separated from the sea by a sandy beach. The green color is due to a great amount of plant organisms on suspension. The origin of its name is due to some seafood called “Clicos” that used to populate the waters of El Golfo. This organisms were extinguished after the population took turtles into this puddle. Medium-size black sand and lapilli.